That was how cattleman Buron Lanier, Burgaw, N.C., described his feelings after the floodwaters of Hurricane Florence, which were 5-feet deep over a significant chunk of his acreage, receded from his farm last September. About one year ago, Lanier was a participant in the American Forage and Grassland Council’s (AFGC) Forage Spokesperson Contest. It was then that he spoke proudly of his and his wife’s (Sara) journey to build a successful cow-calf operation in southeast North Carolina, detailing his positive experiences with novel endophyte tall fescue while also admitting that mistakes were made along the way. Lanier was back at this year’s AFGC conference, but this go-round his message was largely one of heartache, thankfulness, survival, rebirth, and dead tall fescue. But more on that later. Make no mistake; Lanier is still a big fan of novel endophyte tall fescue. His Piney Woods Farm is located on the southern edge of fescue-growing country. When Lanier’s father decided to retire, Buron wanted to transition from row crops to cattle, and he began seeding fields to toxic Kentucky 31 fescue because he liked its productivity. Through educational programs provided by North Carolina State University Extension, Lanier started learning about profitable practices such as winter stockpiling. He also heard about the effects of the toxic endophyte fungus. As a result, when additional land was acquired from his father, he started planting novel endophyte tall fescue. Calf prices were high at that time, and Lanier said it made clear economic sense to convert the rest of the farm to novel endophyte. It took him about five years to transition the entire farm, and as of last year the project was completed with about 300 acres being seeded to novel endophyte tall fescue. 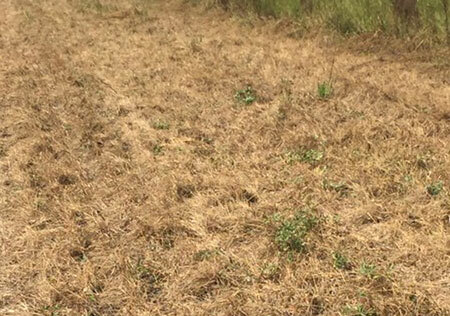 To convert his pastures from toxic fescue, Lanier first sprayed the existing toxic plants, and then he planted a summer annual such as sudangrass. “We got some good grazing benefits from those annuals,” Lanier said. He then sprayed the fields again and planted the novel tall fescue. What little hay was needed, he’d buy locally and only use it in the fall while the pastures were being stockpiled for winter. It was on September 11, 2018, that Hurricane Florence hit the Carolina coast and Lanier’s farm with a vengeance. 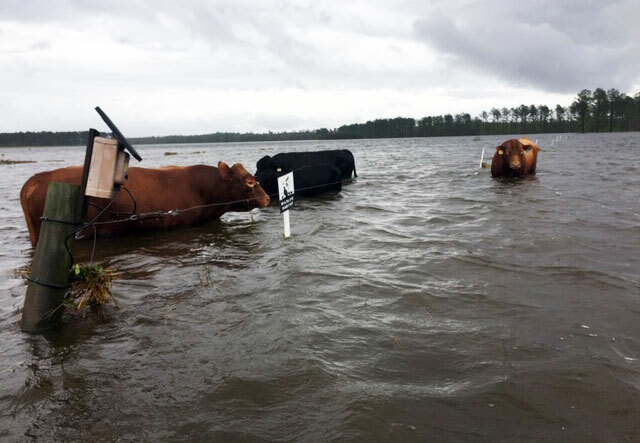 “After three days of pounding by Florence, we had 130 acres of totally submerged pastureland,” Lanier said. “When the storm hit, much of our fescue was being prepared for winter stockpiling. We also had our cows calving about that same time,” he added. Lanier's fescue fields were mostly dead once flood waters receded. Once the water receded after two days, Lanier was disheartened to learn that his fields were dead. Such was also true of most vegetation in the area, including fields of Kentucky 31. Lanier pointed out that his total rainfall for 2018 was 102 inches; this compares to an average of about 58 inches. Thirty-three inches fell in September alone. Acres that didn’t totally flood still only came out of Florence with about a 20 percent stand, largely due to excess rain. After making these assessments, it was then that Lanier realized he was in real trouble with 140 cows plus young stock and virtually nothing to feed them. Once Florence cleared, hay donations began to arrive. “We really appreciated those donations, but as you might expect, following what had already been a wet summer in our region, none of it was really high-quality hay,” Lanier said. “Even so, we fed all of it. We’ve also learned how to use cottonseed and gin trash, the latter of which is about the same as medium-quality hay,” he added. Lanier noted that he had about 30 acres of stockpiled fescue that made it through the deluge and didn’t kill out. “The only reason that happened was because it was mature, about a foot tall when the storm hit,” he explained. Lanier also sold 25 cow-calf pairs this fall, which reduced the herd’s feed demands. Getting the donations of hay and supplements gave him some hope. “If someone else cares about what I’m doing, then I should care about what I’m doing,” he said. Lanier’s recovery plan includes feeding his remaining livestock through winter, and then he will wean and sell all his calves next spring. He will also have some bred cows to sell. As for his pastures, Lanier says he now has the chance to start over with the knowledge of both his successes and failures of past years. He already seeded about 40 acres of novel endophyte tall fescue in late fall. 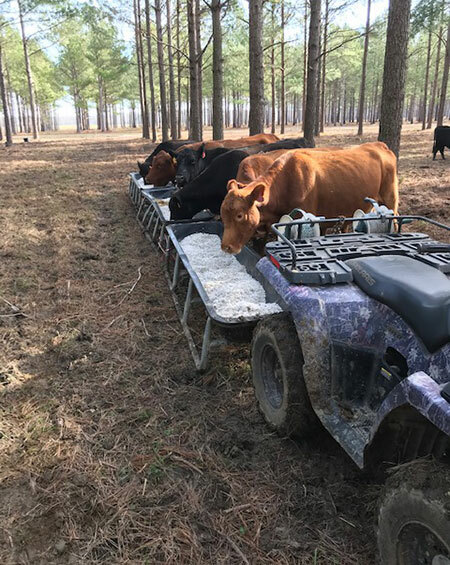 Additionally, he has no-tilled his bottomland into annual forages, which he expects will start providing feed in about 30 days. 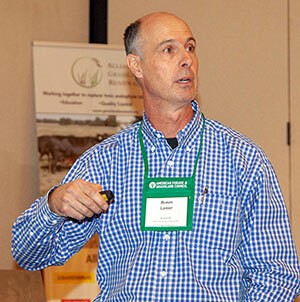 Lanier still plans to base his forage program on novel endophyte tall fescue, but he also will seed more flood-tolerant species such as bahiagrass and native species in his bottomland. There’s still a long road for Lanier to get back to the point in life that existed pre-September 2018, and it’s unknown if we’ll see him back behind the AFGC podium in 2020. But if he is, it’s a good bet that his message will be one of an ongoing successful Florence recovery. Photos for this story were submitted by Buron Lanier.